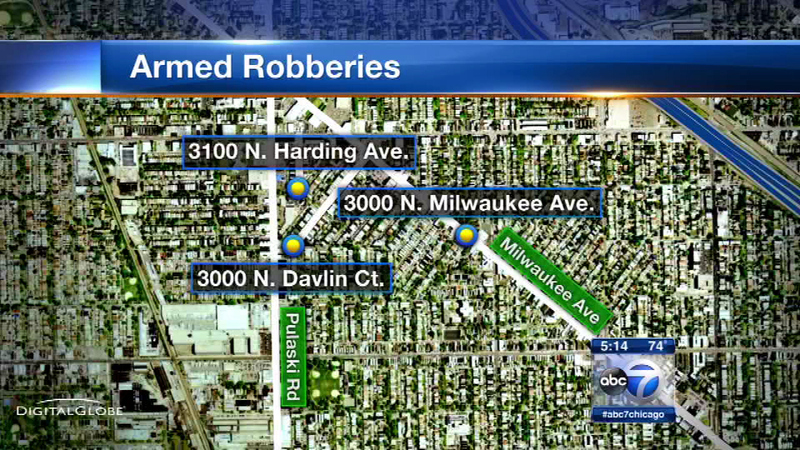 CHICAGO (WLS) -- Police are warning residents about a series of armed robberies on Chicago's northwest side after three people were robbed at gunpoint in Logan Square since August. In each incident, the victims were approached from behind by a group of two or three suspects and then robbed of their phones and wallets. The two most recent attacks took place over Labor Day weekend. Police say that in a robbery in 3100-block of North Harding, a female suspect was involved. Police are urging residents to avoid walking alone late at night.